Join Daphne and Ellen at Mimpi Menjangan for V I B R A N C E, SpiritDance SoulSong’s foundation practice. We’ve created our user-friendly V I B R A N C E, by popular demand for a basic practice, open to all bodies, all ages, shapes, and levels of fitness. From kindergartner’s to seniors, from the fitness world to the yoga mat, to men and to women ready to Wake Up & Roar, to Vibrate, Pulsate, Resonate, physically and metaphysically. SpiritDance SoulSong’s Vibrance is Good Medicine. Morning, Noon, & Night: Early Morning Vibrance energizes for the start of a GREAT Day; mid day Vibrance refills your energetic cup, evening Vibrance, a slower, restorative, calming practice. Vibrance works with SpiritDance SoulSong’s map of the 8 chakras. Vibrance activates your 108 meridians, shakes your 206 bones, moves your 660 muscles, calms your mind, opens your heart, and activates your breath. Vibrance’s series of 60 – 90 minute musical compilations provide you with ‘ready to dance, sound, & sing’ without putting on your DJ hat. 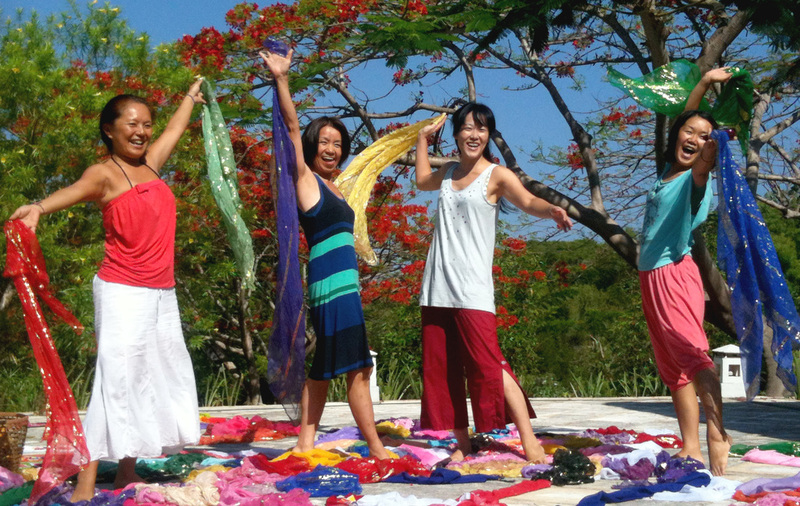 In this retreat, Daphne and Ellen offer an optional Teacher Training module, 2 hours daily for 5 days, for those ready to hold space for others, ready to lead a Vibrance class, ready to inspire yogis and yoginis off the mat to the dance floor and back again. Click any of the questions below for a detailed answer. Of course if you have any further questions do feel free to ask! Ellen and Daphne presented SpiritDance SoulSong at the International Movement Teachers Association gathering in London in July 2015. We look forward to being inducted into the IMTA and recognized as an approved modality in 2016. Producing a program in the perfect environment means considerable cost in producing the program, giving small profit margins for our teachers and staff. MovingVentures has little wiggle room in terms of the pricing. - Referrals: See our referrals page for full details. Claim a coupon code and with a referral, you and your friend will receive $150 discount, each! - Work exchange: If you are skilled in a specialized area, work trade with MovingVentures is a possibility. To be considered, please send us a letter, resume and work samples. Skills in developing SDSS will include professional photography, videography, social-media, marketing, etc. - Crowdfunding: Put the word out to your friends and family via GoFundMe, KickStarter, etc. and let them show their support in helping you fulfill your dream. Mimpi is in a remote location, there are very few other options for accommodation nearby. With classes taking place in early-mornings and evenings, and to keep a warm group dynamic, we do not offer off-site as an option for this program. Depending on where in the world you are traveling from, we suggest giving yourself a few days to relax, get settled and adjust to the time change. Jet lag can be difficult: The earlier you can arrive, the better. Two or three days before should be sufficient. No worries if you're still adjusting during the start of the training: You likely won't be the only one, and the practices and the other students will help your energy and mood, and dancing will get you nice and tired to have restful sleep. How will I get from the airport to The resort? MovingVentures has safe, reliable drivers we have been working with for years in Bali, and we are happy to schedule them for your transportation from the airport to Mimpi. We arrange shared transport as included in the price from South Bali area (Canggu, Kuta, Seminyak, Denpasar) or Ubud area. Otherwise private transport directly from the airport or otehr location will cost $75. We absolutely recognize the need for personal time and rest, and we make sure to schedule down time during the program. On our off days, we usually offer optional activities, such as local temple ceremonies. You may also choose to go to the beach, receive spa treatments, enjoy the hot springs, go diving/snorkelling, or just relax and enjoy alone time. Ubud is definitely worth checking out, about an hour from the airport. Ubud is full of yoga studios, inexpensive massages, dance performances, terrific healthy food and ex-pats who went for a visit and decided to stay! Travel alone, or meet a travel buddy during the training or beforehand on the SDSS 2016 Teacher Training Facebook group, soon to be published! Happening the week before the SDSS retreat and Teacher Training, the Bali Spirit Festival (www.balispiritfestival.com) is a world-class event that attracts top teachers and performers from all over the world. 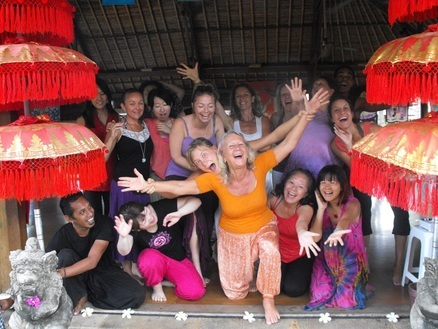 During the day, classes in yoga, dance and more -- including SDSS -- are offered a short drive from Ubud. Then, dance the night away to incredible music at the ARMA museum. Note that we also sell passes with special discounts, and upgrades for volunteers to a full VIP pass. The SDSS 2016 Teacher Training Facebook group will soon be published as a closed group exclusively for teachers and registered and prospective students. Request to be added to the group to stay up to date as the training approaches and to meet your teachers and fellow trainees. You may pay a deposit now of $1,000- to reserve your place. With this deposit we guarantee a final difference to you of no more than 3% variation from prices above. Confirmed prices will be available no later than July 31st. Mary, our Director of Communications, joined the Teacher Training in 2015, then joined our team and returned in 2016. She is now teaching in Philadelphia, USA and will be able to answer any questions you may have.